MakaiLay™ was used to improve the accuracy, speed and safety of the deployment of the “node on a rope” inApril seabed seismic acquisition system, Venator. A best-in-class cable deployment control software was used to enhance a successful at-sea trial deployment of ocean bottom nodes in the Norwegian North Sea from August 17th to 23rd. The trial was conducted by inApril AS, using their node-based seabed acquisition system called Venator and supported by Makai Ocean Engineering, Inc. with the world’s #1 subsea cable deployment software, MakaiLay™ – Seismic module. inApril is a new Norwegian seismic equipment supplier that developed Venator, which focuses on high speed and ‘hands-off’ installation and retrieval of seabed nodes. Their test was conducted over a part of the Edvard Grieg field (PL 338) which is operated by Lundin Petroleum. 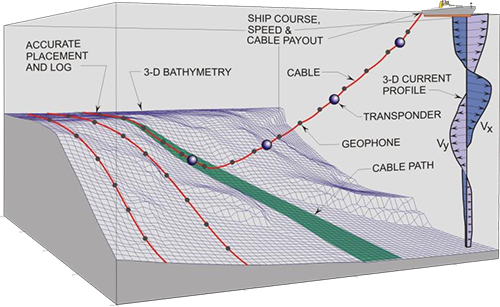 During the trial, the MakaiLay™ seismic software provided real-time feedback to the inApril team based on the proprietary cable model calculations to ensure that the nodes were placed on the seabed accurately during the installation, and that the cable was not over tensioned during the recovery. Careful control during the recovery is the key to avoid dragging the nodes along the seabed. To accomplish this, the MakaiLay™ software uses inputs from all the navigation and cable control instruments on the vessel to calculate accurately in real-time the cable’s shape underwater, the touchdown position, and the slack or tension. The software can automatically adjust the vessel’s navigation and cable payout rate during the operation, or provide instructions to an operator, as was done during the inApril trial. When retrieving the nodes, MakaiLay™ provided the cable engine operator with values of tension at the touchdown point. The trial was successfully completed in water depths of 110 meters, achieving safe deployment and retrieval speeds of 6 knots and 4 knots, respectively. MakaiLay™ integrates with all the typical instruments and data available on a vessel, such as navigation (GPS, Gyro), cable data (tension, cable counter & length), currents (ADCP), and bathymetry. In addition, the accuracy of the MakaiLay™ Seismic module can be improved further by connecting with multiple USBLs that are attached to the nodes along the cable. Combined with a proprietary Adaptive Kalman Filter (KF), the software produces a cable shape that conforms to USBL readings while respecting true cable physics, which prevent the use of erroneous measurements and outliers. This proprietary adaptive KF approach was first developed for US Navy projects and has been successfully validated in numerous sea-trials over the past few years. In case of a hardware failure, the software continues to update its robust, physics-based cable shape, even if no real-time UBSL measurements are received, meaning that incorporating USBL readings can only improve the accuracy of the lay. Makai Ocean Engineering Inc., is a Hawaii-based ocean technology company and the producer of MakaiLay™, an advanced subsea cable installation software. MakaiLay™ enables users to lay submarine cables with the highest level of accuracy, speed, safety, and reliability possible today, dramatically reducing the risk of cable failures. The software has been rigorously tested and validated over 30 years and is used by over 80% of the global fleet of telecom cable ships on countless commercial lays and military installations to successfully install well over 500,000 km of cable worldwide.